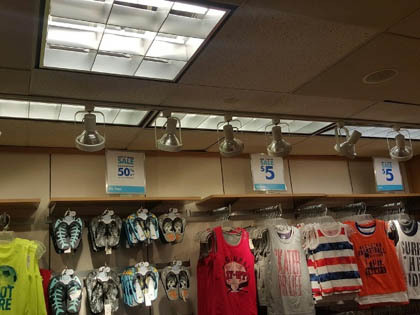 On Sunday evening after closing, a large national children’s retailer in Ohio called in needing emergency water damage restoration services for damaged the ceiling tiles and hardwood floors of one of their retail stores. The store requested to be in condition to open the next morning at 10:00 AM. Reassuring the client, the DKI member on the call told them that they would do everything possible to be able to reopen the following day. 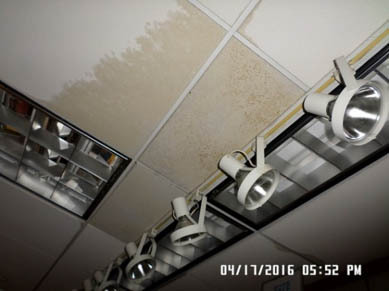 Since the ceiling tiles had to be special ordered, they told the client they would install temporary tiles that evening after the electricians finished inspecting the ceiling’s light fixtures. To expedite the temporary tiling, DKI completed an inspection of the lighting and luckily discovered very little water; therefore, the team was able to continue their process without the assistance of the technicians who hadn’t yet arrived. They installed the temporary tiles, then cleaned, sanitized and deodorized all affected areas, including the floors, racks, walls, electronics and sales desk. Monday morning, the store reopened as promised. During the next five days, the crews set up drying equipment before closing time to run overnight, then removed all of the equipment before opening the next morning. This process allowed the store to function as normal, without disruption during the restoration.